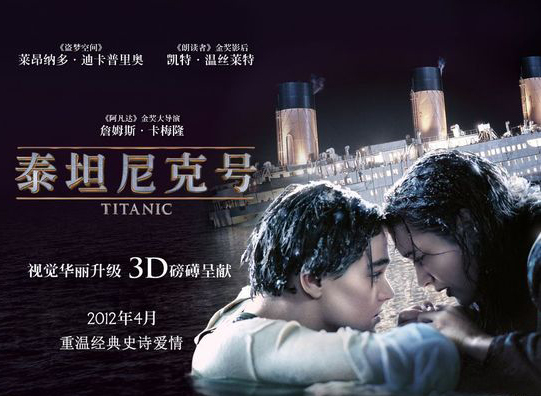 According to Entgroup figures, TITANIC 3D made RMB 467 million in its first six days in Mainland Chinese cinemas (another chart puts it at 468, but let’s not nitpick, alright?). If the other box office chart I’ve read is accurate, that means it’ll overtake MISSION: IMPOSSIBLE - GHOST PROTOCOL’s RMB 678.9 million take to become the highest-grossing film of 2012. Considering that it also beat the 438 million record set by TRANSFORMERS 3 (which ended up making RMB 1.11 billion), we’d looking at it breaking AVATAR’s RMB 1.39 billion record if Fox didn’t already announce that they’re pulling the film by May 20th. And Hollywood’s not done yet. BATTLESHIP and the second GHOST RIDER movie are opening this weekend, and THE AVENGERS will replace those screens on May 5th. With the May Golden Week holiday, it’s guaranteed that these three films (plus TITANIC) will be rolling in the dough. Considering that last year’s Golden Week brought THE LOST BLADESMAN and CHINESE GHOST STORY - both of which made over RMB 100 million - The Chinese film industry must have something powerful to counter the Hollywood invasion, right?